An exploration of the Blue and Wallowa Mountains of northeastern Oregon, a remote and little-known region sometimes described as “Oregon’s Alps.” In between the high mountain passes are many pleasant miles meandering along next to wild, scenic rivers: three forks of the John Day, the Powder, the Imnaha, the Wallowa, the Lostine, the Minam, the Grand Ronde, and more. Aside from its impressive mountains and wild rivers, it offers something cyclists always appreciate: next to no traffic. It’s a very bike-friendly environment. This tour is a long way from most other places. It’s out there. Coming up from California, we broke the driving time up by spending a night at a motel in the city of Bend, then drove 170 miles east on the morning of our first stage. On the final stage, we reversed that process, driving back to Bend for another night before heading home. Leave extra cars at the high school in Long Creek and head north over a moderate climb, followed by a ripper descent into the canyon of the John Day River. Ride for 40 beautiful miles along the Upper Middle Fork of the John Day River in the Blue Mountains. After the river run, two moderate mountain passes lead to an overnight near the tiny town of Sumpter, where there is a camp in a huge meadow outside town. Excellent showers. There are also motels in the town of Sumpter. A transitional stage, moving from the Blues out across the broad Powder River Valley and into the foothills of the Wallowas. Aside from the mid-ride transit of Baker City, this is another quiet day of riding through a peaceful, pastoral landscape. Vast ranches and farmlands, rolling hills and open, grassy valleys. One big climb near the end of the day. Overnight on a shady lawn at the high school in the little town of Halfway. Showers. There are motels in the town as well. The first really hilly stage, with two long but gradual climbs—on a remote forest road—through the alpine grandeur of the Wallowa Mountains. Plenty of epic descending as well. Optional out-&-back visits the Hells Canyon Scenic Overlook: panoramic vistas over the immense gorge of the mighty Snake River. 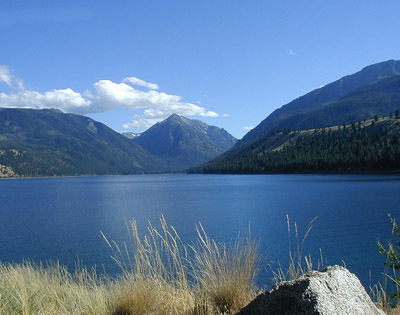 Visit the charming town of Joseph and then finish up in a lovely group site on the shore of spectacular Wallowa Lake (above). Excellent showers. There are also lodgings at the lake. The longest stage, but not the hardest: only one moderate climb all day. A long, lazy glide downstream along the Wallowa River Valley, then the one climb over the ridge, and finally more easy miles wandering down the Grand Ronde River Valley to the village of Cove. Overnight at Forest Cove Warm Springs, a quaint old resort with a large swimming pool heated to 86° by a pure, natural hot spring. (We loved this old resort.) There are no lodgings near Cove, but there is an old hotel—recently renovated—in Union, 8 miles into the next’s day’s stage. The big challenge today is the final climb to Anthony Lake: 3800′ up in 11 miles. Prior to that climb, both long and short routes are relatively easy. Rolling terrain recrossing the Powder River Valley, as we say goodbye to the Wallowa range and return to the Blues. The long route adds a scenic detour along pretty Catherine Creek. Overnight in a secluded group site at exquisite Anthony Lake, or in the standard camp nearby. (Note: some of us came up with a hybrid route: follow the long route partway—the first miles along Catherine Creek are the best—then retrace to the short route for a 63-mile day.) There are no motels near Anthony Lake. However, there is one cabin in the park—a former Ranger’s home—which can be rented. I’m not sure if bedding is provided. After the big climb yesterday, some payback: loads of frisky descents, all day long (but a few more climbs too). This is the definitive middle of nowhere. Not one town all day; hardly any houses even. No traffic at all. Just deep forest, rocky ramparts, and the pristine headwaters of the Grand Ronde River. *The camp we used on our tour at the end of this stage—Lehman Hot Springs—has closed. 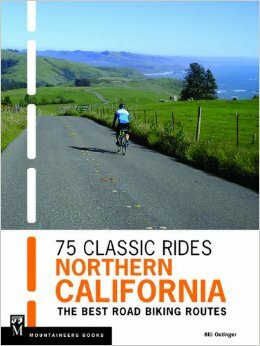 The best alternative I can think of is to push on to the town of Ukiah and stay in either of two motels. That turns what was a 64-mile stage into an 81-mile day. Long, but not too hard, as it is almost all downhill. The shortest and probably easiest stage of the tour. Beginning with endless, dream-like descending along the scenic corridor of Camas Creek, then two medium-hard climbs, paired with two big descents to wrap things up. Finish back in Long Creek—where we started—and then return to Bend for one more night in a motel. *With the previous night’s stay shifted to Ukiah, this final stage is reduced to just 40 miles. But that’s okay, as it’s a getaway day, with a drive to Bend or elsewhere after the ride.